I graduated from Couch to 5K. Thinking I had more than one workout left because of the “free run” button at the end, I went into yesterday’s run primarily concerned about getting to run in my BRAND NEW SHOES (see post below; they’re glorious). However, at the end of the run, I realized that the “free run” was an indefinite button — I could log workouts into the future. But that meant that after yesterday’s run, my first stab at Couch to 5K was over. Just like that. For my last workout, I did what I’ve been doing — I ran for about 39 minutes, using the extra few past 36 to make up for (more than make up for, really) any time I took a sip of water or changed the TV station, and did my five minute walking warmup. This amounted to 3.6 miles, all told. And so, my last three miles of Couch to 5K and my first three miles in my new shoes were one and the same. The passing of a torch, in a way. I’ll be updating soon with my plans for how I’m going to continue running (and I am, of course, going to continue) and you’ll be hearing about my adventures. The new “title” for my running adventures? YUP I REALLY AM GOING WITH THAT. What’s really amazing to me, though, is that I finished the C25K program at all. When I first started, I thought nine weeks sounded like forever. I also felt very skeptical that I could ever, ever, ever finish that much running. I also didn’t believe I’d do it three times a week — let alone 6. I also didn’t believe I’d ever grow to like it. But the nine weeks flew by; I not only finished “that much running,” but added 6 extra minutes to my daily routine (because I run 12-minute miles, not 10-minute miles, those extra 6 minutes are needed to reach the full 3.1 miles); I run 5-6 times a week happily; I’ve grown to enjoy it — I look forward to it every day. It probably sounds hokey to say that Couch to 5K changed my life, but I suppose it did. When I started, I was nearly ten lbs heavier and incapable of running a single mile. Now, even though I run slow, I run steady. And as I always say, “That’s not nothin’.” For most of my life, running has felt like a door that’s been closed to me. Mom is good at it. Matt is good at it. My friends were good at it. I never was, but always wished I could be. What I’ve learned, I think, these past nine weeks is that I AM a runner/can be a runner, and that “good” is relative. I don’t need to be FAST to be good. I don’t need to run marathons to be good — although it would be cool to run one (baby steps… baby steps…). The discovery: All I need to do, to be “a runner,” is to run. And for me, that is nothing short of a miracle. So thanks, Couch to 5K. Your terrible voice actors and occasionally glitchy logging feature were there for me every step of the way. Literally. You gave me structure and routine, and pushed me harder than I thought I could go (DAMN YOU WEEK THREE). You made me feel accomplished. You gave me a visual representation of how far I’ve come. You kept count for me. You counted ON me to be there three times a week (at LEAST), and always made me want to be better and to keep going. In your strange little poorly-voice-acted way, you changed who I am. How can I say “thank you” enough times for that? Thanks for accompanying me on this journey so far — we’ve got many more adventures to experience, too, what with me and these great new running shoes. Today begins Week 9, the FINAL WEEK. Wow, wow, wow, wowee wow. For Week 8, I admittedly didn’t listen to the app very much. I did what I wanted, which was to run three full miles instead of just running for 28 minutes. And in my defense the app is glitching and not letting my log my specific workouts anyway so it all hardly matters. Here’s my reasoning: Couch to 5K is designed so that if you run a 10 minute mile, you’ll be running three of them by the end of Week 9. Which is all well and good… If you can run a ten minute mile. I would venture to guess that most people (including myself) who are using Couch to 5K do NOT run ten minute miles. I believe I’m capable of it — it’s actually my next goal, which I’ll explain in a later post after I’ve finished Couch to 5K — but if I just follow the C25K program itself without upping my speed, that 3-mile marker is never going to hit. It takes me 36 minutes to run three miles — not 30. See what I mean? Also worth noting: I usually still run for three minutes of my cooldown. SO. Here’s what I have been thinking, then. If warmup is 5 minutes. And then C25K says, “Run for 28,” and then cooldown is 5, and if I run for three minutes of the cooldown anyway… then that’s 31 minutes. THAT’S ONLY FIVE MINUTES AWAY FROM 3 MILES. Which is just dumb not to pursue. So I run the full three then walk extra at the end. I use the timer on my phone to guide me in places the app falls short or doesn’t last long enough. It would take me 48 minutes and really, I ain’t got time for that. But yep yep, Week 8 is over. LET THE LAST LEG OF THE JOURNEY BEGIN! Ran again today – 3 miles again. I stopped once to change episodes of my show (damned Wii remote) and once for a sip of water since I coughed, for unknown reasons. Including my warmup, it was 3.5 miles. Sometimes I worry that I get too giddy about this stuff — that I’m annoying anybody who might read or hear about it; but then I think to myself, If I can’t talk about it here then where CAN I talk about it? I figure, if you are reading this or following the blog, you’re probably interested in wellness or at least in me, so maybe you’re as happy about my successes as I am. And so I will say this: it just occurred to me that in the past two days, I have run 6 miles. 6 miles in two days! Sheepers creepers! If you count my warmup of brisk walking, it’s been 7 miles. Even this time last week, I probably wouldn’t have believed that the third mile would come as easily as it did. But somehow, it was easier than the first two miles — I’m not complaining! Anyway, just thought I’d pop in to say I repeated yesterday’s success. 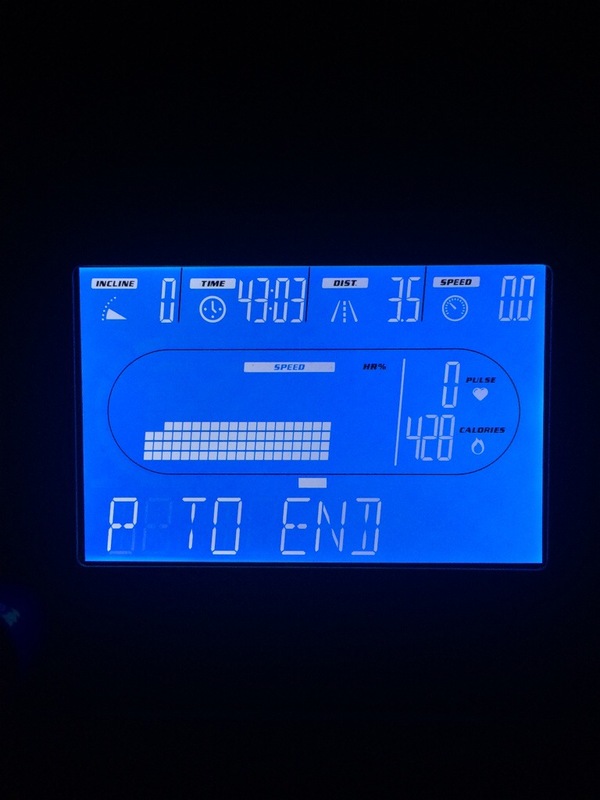 By the way, here’s a picture of yesterday’s treadmill post-run! I was going to wait until Monday to post about this, but I couldn’t. I just couldn’t. Today was Week 7, Day 3. Should’ve been warm up, cool down, and 25 minute run. Run for 30, I told myself. But then 30 hit, and I felt good. And so I thought, Why not 36? For those of you who have been following along, I run/jog at 5.0. Which makes 36 minutes of running THREE FULL MILES. And being that I ran for 37:45, I think it’s pretty safe to say THAT I RAN THREE FULL MILES WITHOUT STOPPING FOR THE FIRST TIME EVER IN MY LIFE. The good part: It wasn’t that bad! The very best part: I never ever ever thought I could do that. Ever. Um, Week 7 is SO not subtle. Day 1: Run for 25 minutes. Now, because I forced myself to do this back when they only asked me to run 20 minutes (I was intent on hitting that 2 mile marker, and at 5.0 24 minutes is needed for that), I was not too terrified. I did it, and it was fine. At one point I did have to stop for about 23 seconds to hit buttons on the remote to start the next episode of The Office (we have the Wii hooked up in the basement which is how we’re streaming Netflix to that TV and I CHALLENGE you to use a Wii remote while still running), but I ran for an extra 1 minute at the end (so, 26 minutes total) to make up for it. I didn’t linger. I just had to wake up the remote and clickety-click. As I’m running the full 26, I find that I get a little bit restless but I think that’s only because I have gotten so used to the time being broken up into smaller increments — it’s not because I’m TIRED or DYING. But it’s hard to figure out how to deal with the restlessness. I’m sure I’ll get used to it as time goes on. I find myself eying the clock too often. And again, it’s not because I’m too fatigued — I think I’m just too used to those distances being broken up. I tell myself, The important thing isn’t whether or not you’re bored at times — the important thing is that you can (and HAVE) run more than two miles without stopping, now! I tell myself, You will get used to this. Just like you got used to the broken-up times, you’ll get used to the all-at-once times. I tell myself, You are seven whole weeks in, and going strong. An actual 5K run is within reaching distance. I tell myself, Yanno, I’m really proud of you. Today, on Week 6, Day 2, I ran TWO FULL MILES WITHOUT STOPPING. AND ERGO I AM UNSTOPPABLE. I survived Week 5! And with zest and zeal, I might add. So now, I’m on Week 6, which started with a pleasantly light run yesterday. Rather than wax philosophical about the workout itself, I’ll instead tell you about what it did for me. I mean REALLY stressed out. I am really, really worn thin at this point in the semester. Thankfully, Chelsea and the cats are wonderful and so is my family, and so are my friends. But that doesn’t really make the days that much easier to force my way through, you know?Yesterday was a truly bad day. I felt like all my responsibilities were crashing down around me with the force of a typhoon — it gave the sense of there being no light at the end of the tunnel. Exhausted. Fatigued. Three cold sores. A fever. A bad day. I HAD HAD IT WITH MYSELF. When I got home from my last leg of the day, Chelsea agreed to heat up supper (we were having leftover lentil soup) while I went for my run. I went down into the basement defeated and withered after a crappy, brow-beating day. I came back up after my run feeling relaxed, more in-control, relieved, and grateful for the chance to reconnect with my body BEYOND all the stress it’s been enduring. Shock of shocks: I actually found comfort in my run, and not for the first time. If you’d told me six weeks ago that by mid-March I’d find my daily run to be a comfort, I’d have laughed at you. Perhaps I don’t know myself that well after all. And perhaps that is a good thing.